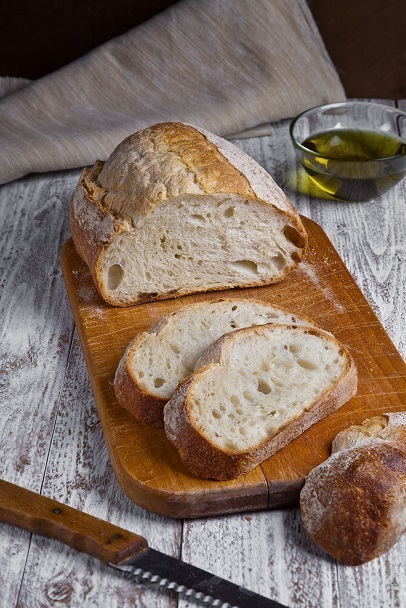 Did you know the way sourdough bread is prepared helps improve its nutrition value? The sourdough starter as it is called, pre-digests starches, making the bread more easily digestible. Because of this it lowers insulin response, thus improving glucose tolerance. The pre-digested starches helps protect Vitamin B-1 from the damage of the heat will the bread is being baked. The pre-digested starches also break down the gluten, resulting in a bread that gluten-sensitive people can eat. The process also breaks down phytases which free up minerals for better absorption, such as zinc, iron, magnesium, copper, and phosphorus. Don’t be FOOLED into believing folic acid is better for you, as it is the synthetic form of folate, and folate is made in nature and is bio-available to the body. One medium slice of sourdough has 95 micrograms of folate, which is 24% of the daily required amount needed for good health. Lack of folate in the diet would make you more susceptible to developing cancer, age-related vision loss, hearing loss, and heart disease. So this April first (2015) enjoy a slice or two of sourdough bread, and We’re Not Fooling. Grill or roast prepared Brussels sprouts. In a medium bowl mix with cooked, chopped bacon. 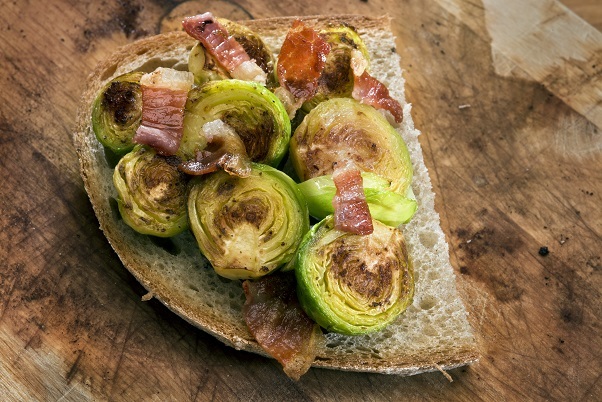 Warm the slices of sourdough bread, and top with the grilled Brussels sprouts and Bacon. Spread sourdough with chutney. Next layer with one or two turkey slices, add fried egg, avocado slices, and top with a sprig of dill and some baby spinach leaves. 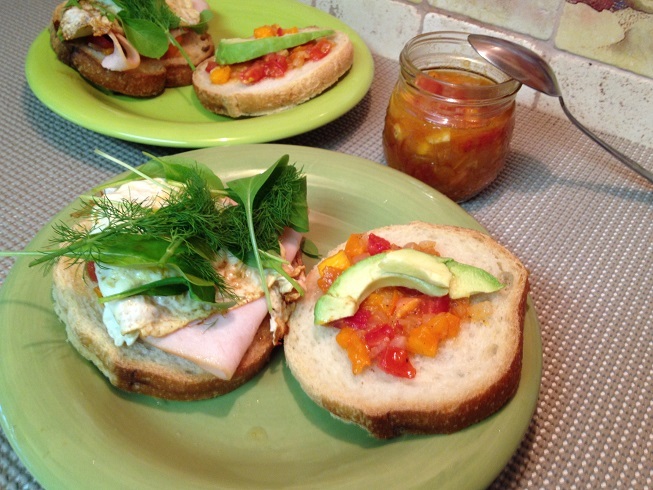 Enjoy this sandwich for Sunday brunch, breakfast or lunch. Stop Fooling around and get to the kitchen and prepare your sourdough bread with either Grilled Brussels sprouts and Bacon or Turkey Avocado and Dill Sandwich. This entry was posted in Breakfast, Brunch or Lunch, Meals in 30 Minutes or Less, Party Favorites and tagged American Heart Association, B vitamins, Brussels Sprouts, Folic Acid, Harvard School of Public Health, Hypertension, JAMA (journal), Lenox Hill Hospital, National Institutes of Health, sourdough bread, sourdough starter, Tomato Chutney, Vasotec coupon, Walter Willett. Bookmark the permalink. Thanks Roger for your thoughts and visit.